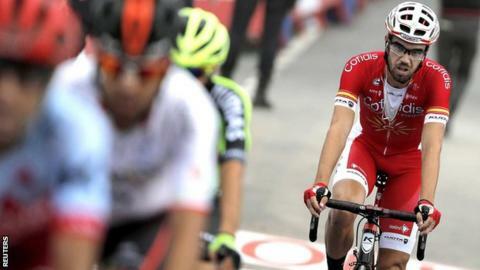 Briton Simon Yates lost the Vuelta a Espana leader's jersey to Jesus Herrada as Alexandre Geniez emerged from a breakaway group to win stage 12. Yates and his Mitchelton-Scott team did not react as Spanish Cofidis rider Herrada opened up a large gap in a big breakaway on Thursday's 177.5km ride. Herrada began the day five minutes and 45 seconds behind Yates but now has a three-minute, 22-second lead over him. Yates finished in the peloton with Alejandro Valverde and Nairo Quintana. Listen: BeSpoke - Can Yates win the tightest Vuelta? The 26-year-old is now second overall, still with a one-second advantage over Valverde, who is third, and a 14-second gap on Quintana in fourth. "We decided not to really chase anyone today," Yates said. "We were just going to ride to keep it at a decent gap and that's what we did. Now we don't have to control anything before the weekend, it's a really important part of the race," he added. "We're looking forward to the race starting for real, which is tomorrow. I am feeling good so now I've just got to try and recover before then." Herrada, 28, finished in a group left back as the breakaway split in the stage's latter stages, two minutes and 33 seconds behind the winner. French AG2R La Mondiale rider Geniez held off Team Sky's Dylan van Baarle in a sprint to the line on the Galician coast after a route, from Mondonedo to Faro de Estaca de Bares, that featured two category-three climbs. "It is hard to believe," Herrada said. "To take the lead is a dream, I couldn't challenge for the stage because I was exhausted but it's reward for the work we have been doing for a long time. "I'm not thinking about the podium for now but I'll take it day by day and at least we have achieved this." Shortly after passing the finishing line, Van Baarle suffered the misfortune of crashing into an official who did not look before crossing the narrow road down which the riders were still travelling at high speed. Team Sky's team doctor Neil Heron said the Belgian suffered "a few cuts to his right hip and elbow as well as a bruise on the right side of his ribs". He added: "He has quite a lot of pain in his right thigh - at the minute I think this is just from the impact of the bike on his thigh but we will need to see over the next few hours." Friday's stage 13 takes the riders across a 174.8km route that features one category-three climb and two category-one climbs, including a summit finish on the Alto de la Camperona.